While many brands nowadays branch into tonnes of different products, I always feel that Pixi sticks to what they know and love, and it works for them. They tend to be all about creating a bright, fresh look with their makeup, and nurturing a healthy, glowing complexion with their skincare line. 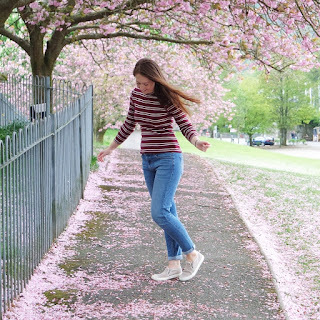 I love pretty, natural makeup all year round, but especially during Spring when the flowers are making their appearance and everything feels renewed. 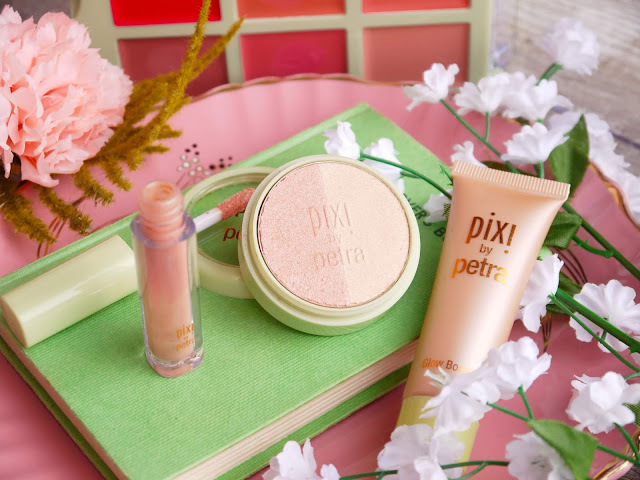 With flattering formulas and radiant finishes, these Pixi products are perfect if you're refreshing your makeup routine for the season. At first I assumed this was a liquid highlighter that could be mixed in with foundation or applied on top, but it's very runny and not super shiny, so my personal preference is to apply it alone or under makeup to add a glow when my skin is dull. It doesn't feel at all greasy or heavy on the skin, and the slight peach tint adds to to the brightening effect. When I was growing up there was a big trend for plumping lipglosses, and I remember formulas that were so high in menthol your lips would feel as though they were on fire! Luckily, Pixi created one with just the right amount, so it feels fresh and very slightly tingly but not at all irritating on the lips. As well as plumping the lips slightly, bringing the blood to them has the added effect of making them more pink, making this a really handy gloss to keep in your bag or just sweep on when you're rushed or looking for an easy option. The micro shimmers in the formula serve to enhance the healthy lip look without feeling gritty. It's almost like a cross between a thick gloss and a balm, so your hair may get caught in it but it won't disappear in minutes. 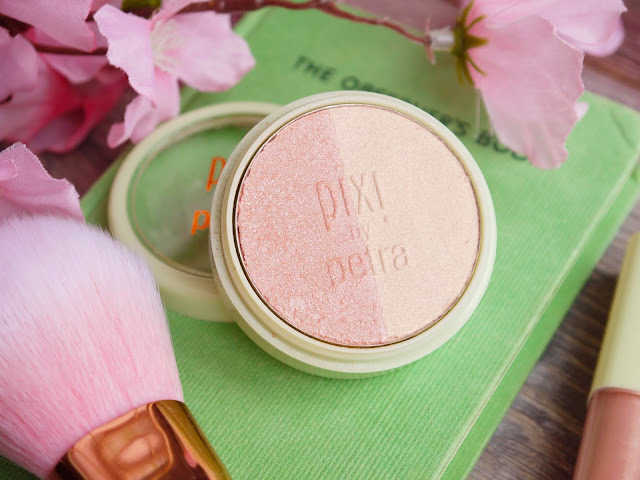 This formula is sadly a little chalky so again, it doesn't have that bright, metallic highlighter look, and neither shade looks quite right on the cheekbones, but I like to swirl them together to use as a blush topper for a peachy glow on the cheeks. Dulce Candy was one of the first YouTubers I began watching around 5 years ago, so I trust her experience and knowledge and it was exciting to see her collaborate with Pixi on versatile cheek and eye palettes that are natural and pretty, in line with their other products. 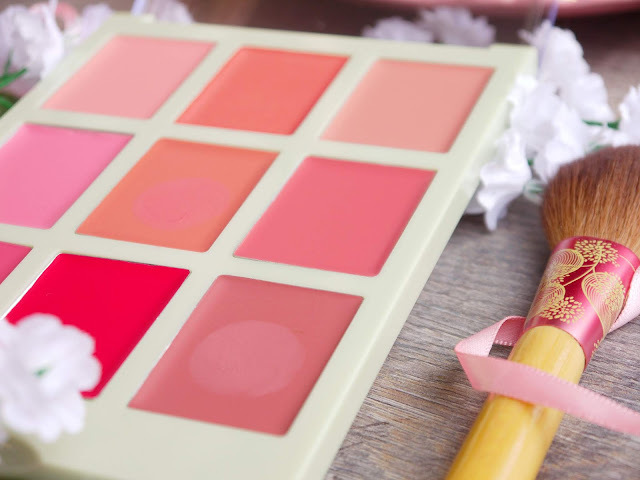 The formula in the lip candy palette is similar to my beloved Stila Convertible Colours in that it feels comfortable and looks good on both cheeks and lips. While I'm a long time lover of cream blush I imagine even oily skins would like this because it feels more like a stain sinking into the skin than a product sitting on top of it. There is a shade in the palette to suit everyone, and they can be built up for more intensity or mixed on the large lid to create custom colours, making this an ideal pick for makeup artists or frequent travellers. The only flaw is that the creams won't last all day on your lips, and it's quite a big palette to cart around in your bag for top ups. What makeup products do you reach for in Spring?